The incidence of spine infections is on the rise, reported to be about one in 100,000–200,000 in the general population., Spinal infections in the immunocompromised patient population, though uncommon and not reported exclusively, are probably underestimated., Immunocompromised organ transplant patients have a 40-fold increased risk  for spinal infections. 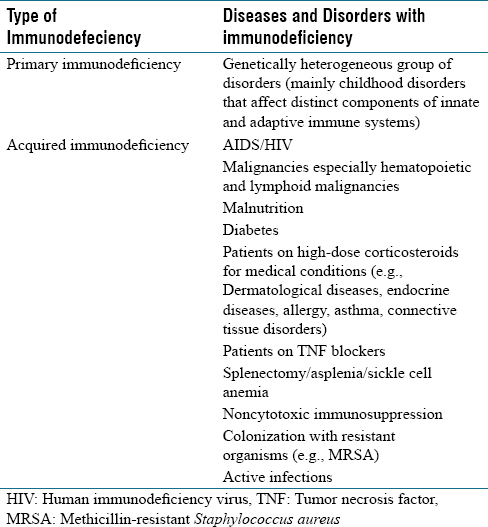 Human immunodeficiency virus (HIV) patients, intravenous (IV) drug users, alcoholics, cirrhosis patients, diabetes mellitus, malnutrition, cancer patients, immunosuppression associated with chemotherapy for cancer, transplantation, or autoimmune diseases are the commonly occurring immunosuppressive states making these patients prone to spinal infections [Table 1].,,,, They are prone to frequent bacteremia episodes and subsequent hematogenous seeding of the spine. The infection can occur without a definite source or bacteremia, particularly in the setting of immunosuppression. The present review is an attempt to bring out the currently available literature on diagnosis and treatment of spinal infections in the immunocompromised host including some of the atypical spinal infections. Although this is not a comprehensive review of the spinal infection literature for the immunocompromised conditions, a PubMed/Medline search and review of the English language literature on atypical spinal infection, including fungal and parasitic infections and spinal infections in the immunocompromised patients, was performed. Clinical presentation, diagnosis, and treatment aspects of spinal infections were correlated with immunocompromising medical comorbidities. The immune system can have a functional deficiency either in the humoral or in the cellular immunity. Deficiency in humoral immunity increases susceptibility to pyogenic organisms such as Haemophilus influenzae, Streptococcus, and Staphylococcus, whereas abnormalities in cellular immunity may preferentially predispose to viral, fungal, and protozoan infections; however, both mechanisms are interdependent and are affected together in a given immunocompromised state [Table 2]. HIV-infected patients are one of the most common groups to be affected with immune deficiency. Staphylococcus and tuberculosis are the most common organisms isolated in immunocompromised patients with HIV. In India, tuberculosis is the main cause of spinal infections while the scenario is different in the Western world where pyogenic bacterial infection is much more common than tuberculosis., However, with the rise in immunocompromised patients and HIV patients, tuberculous spondylodiscitis has also shown an increasing trend in the Western world. An HIV patient experiences a progressive decline and dysfunction of T-cells and monocytes with interleukin (IL)-15, interferon (IFN) alpha, tumor necrosis factor (TNF), IL-18, IL-10 cytokine dysregulation, leading to defective immune response.,,, Infected patients experience rapid progression of disease and greater risk for life. Acquiring tuberculosis (TB) in HIV patients is independent of CD4-T-cells count although suppressed IL-12 and IFN alpha levels increase susceptibility to primary TB infection and reactivation of old disease. There is reversal of CD4:CD8 T-cell ratio and significantly reduced cytokine expression and increased TNF levels. There exists a linear relationship between CD4 count and severity of the spinal infections and other opportunistic infections. Further, CD4-lymphocyte count is a useful parameter in assessing risk of postoperative infections. A cell count <200/mm 3 is associated with a greater risk for postoperative infection,, and hence, it is advisable to defer elective surgeries with low CD4 counts until the immune system recovers. IV drug abusers are another group of patients which can present with spinal infections with these opportunistic pathogens. Classically, pseudomonas infection has been described in them.,, Cervical spine involvement is seen more commonly in patients with IV drug users as compared to normal population. Heroin users have direct immunosuppression with T-cell inactivation,, and in the rest of the IV drug users, it is a combination of malnutrition and repeated bacteremia with needle pricks. Diabetes mellitus is another common disorder with deranged immune system along with complex metabolic derangement of glucose metabolism. Immune system in patients with diabetes shows changes in both humoral and cellular responses., There are alterations in antibody response to antigen and dysregulation of complement response (C3 and C4, C1 inhibitor). Cellular immunity is also compromised with direct effects on T-cell population , and secondary to alterations in cytokine signaling, TNF, IL-1β, IL-2, IL-6, IL-8, and insulin-like growth factor-2., The increased inflammation along with cytokine dysregulation may contribute to the immunocompromised state associated with diabetes. There is a 5.7-fold increased relative risk for infection in these patients. Pharmacological agents such as methotrexate, corticosteroids, and chemotherapeutic agents cause direct marrow suppression and affect both the humoral and cellular immune response. Low-virulence, opportunistic, and often severe infections affect these patients frequently along with reactivation of occult previous infections. Spinal infections in the immunocompromised may have insidious clinical presentations. Back pain may be the only presenting symptom unless progression of the disease results in neurological deficits. One of the major problems in the treatment of spondylodiscitis in the immunocompromised host is the relative delay in diagnosis as the presentation is vague. Routine radiographs are of little help for the back pain in early stages, making the diagnosis a challenge. On an average, the time interval between symptom to diagnosis range from 2 weeks to 9 months., Delay in diagnosis of spine infection in these patients may lead to permanent disability with spinal cord injury. Spondylodiscitis should always be a differential diagnosis in the setting of a new-onset back/neck pain in these high-risk group patients. Though fever is a common feature of spine infections, it is inconsistent in such high-risk groups [Table 3] and less so in fungal, mycobacterial, and Brucella More Details infections. Rarely, patients present with an acute-onset severe back pain in the setting of a chronic low back pain along with fever and radicular symptoms or neurologic deficits ,,. It is not uncommon to see a patient with neurological deficit in tubercular spondylitis with minimal back pain. Facet joint septic arthritis is one of the conditions to look for in an immunocompromised host. Routine screening investigation for infections, such as erythrocyte sedimentation rate (ESR), C-reactive protein, white blood cell (WBC), and complete blood count in an immunocompromised host, may not reveal an elevated WBC or ESR due to patient's decreased ability to mount a immune response (only 27%–30% showed elevated WBC count ). Protocol for evaluating patients with suspected spinal infections in immunocompromised status starts with detailed history for known immunocompromised states and any addictions such as IV drug abuse or alcoholism, along with laboratory tests and imaging of the spine. Magnetic resonance imaging (MRI) best visualizes typical findings in spinal infections such as abnormal signal enhancement in the involved intervertebral disc and adjacent vertebral body marrow, loss of disc space, and epidural and paraspinal abscess. It has sensitivity of 96% and specificity of 93%. MRI findings suggestive of infection include hypointense signal of disc and end plate on T1, hyperintense signal from disc and end plate on T2, loss of disc height, epidural abscess, and prevertebral and paravertebral collections. Gadolinium contrast enhancement is of value in differentiating infection from Modic changes (Type 1) and tumors. It is hence necessary to look for other signs which suggest infection, such as intradiscal hyperintense signal on T2-weighted images, epidural and paraspinal fluid collections, and loss of degenerative disc vacuum, so as not to delay the diagnosis.,, However, it is important to be aware of atypical presentations of spinal infections, such as lack of enhancement of involved areas. Patients' immune compromise status may prevent them from mounting the inflammatory and vascular response necessary to produce such enhancement. Gadolinium contrast helps in delineating a phlegmon and a formed epidural abscess. It increases specificity as the end plate enhancement can be the earliest sign of acute spondylodiscitis., In patients where MRI is contraindicated, contrast-enhanced computed tomography/positron emission tomography (CT/PET) scan or a bone scintigraphy may be able to establish the diagnosis. 18F-fluorodeoxyglucose (18F-FDG) PET can differentiate active from inactive disease in patients with TB, and this is potentially an important clinical application in these patients. There is overlap in the standardized uptake values of TB and malignant lesions on 18F-FDG PET, which limits its usefulness in distinguishing them. Further, a study reported that 18F-FDG PET/CT was more effective than MRI in distinguishing between tuberculous and pyogenic spondylitis. Another review by Rivas-Garcia et al. on the image findings in Pott's disease emphasizes the role of advanced imaging such as 18F-FDG-PET in the assessment of lesion extent, as a guide to biopsy, to assist in surgical planning, and to contribute to follow-up evaluation. Blood cultures should be a routine investigation to be done in high-risk group patients with fever and back pain as they are roughly positive in 60% of bacterial spondylodiscitis cases. CT-guided biopsy plays an important role for diagnosis with accuracy of 30%–75%, especially in patients with negative blood cultures.,, Standard protocol should include aerobic/anaerobic, bacterial, mycobacterial, fungal stains and cultures with a biopsy for histopathological examination, especially in culture-negative cases to confirm diagnosis. Biopsy yield is affected by prior antibiotic use. Molecular diagnosis with polymerase chain reaction (PCR) techniques may help in the isolation of organism in paucibacillary infections such as Mycobacterium tuberculosis and other infections as well. GeneXpert test may also help identify resistance to rifampicin in addition to isolating the organism by PCR technique. Serological tests are of value in diagnosing Brucella infections. Conservative treatment consists of antibiotic administration, appropriate to the culture, and sensitivity with restricted activity. Surgical intervention is indicated in the presence of neurological deficits, failure to respond to conservative treatment, progression of disease/deformity, and need to identify positive pathogens in case of negative cultures and percutaneous biopsy. Systemic antibiotics for 6–8 weeks is sufficient for most cases., Monotherapy is better avoided, especially for organisms such as Staphylococcus aureus species known to show resistance. Response is monitored using serial inflammatory markers along with clinical improvement. Relapse of spine infections are very high in immunocompromised patients and morbidity from the condition is also very high. Surgical management becomes necessary for patients with a neurologic deficit, uncontrolled infection, or instability of the spine due to extensive bone destruction. The surgical intervention must achieve the goals of rigid 3-column stabilization of the spine with adequate decompression of the spinal cord, along with debridement and material for biopsy. This can be achieved either with anterior approach, posterior approach, or a combined approach. Anterior approach involves thoracotomy, decompression of the cord with corpectomy, and spinal stabilization with cage and anterior instrumentation, whereas a posterior-only approach involves pedicle screw-rod stabilization with corpectomy and cage insertion via the retropleural approach., Combined approach is usually avoided in these patients due to the associated increase in morbidity and mortality in the already immunocompromised host. Use of instrumentation in the active infective stage is no longer prohibited, and the stability achieved along with good debridement of infective focus usually aids in faster resolution of the infective focus., Septic infections of facet joints can be treated along the same lines of vertebral osteomyelitis. A CT-guided purulent aspiration from facet joint is known to help with faster pain relief. Patients with altered immune status related to diabetes mellitus, corticosteroid usage, chemotherapy, malnutrition, HIV, and organ transplantation are predisposed to fungal infections of the spine., Fungal spinal infections can range from a simple discitis to more complicated and destructive multifocal osteomyelitis with huge abscess and sometimes deformity. In a large review from 1948 to 2010, a total of 157 cases of fungal infections affecting the spine were recorded. Aspergillosis was the most common fungal infection affecting the spine, followed by the Candida species. Other less common fungal infections were coccidioidomycosis, cryptococcosis, histoplasmosis, and blastomycosis.,, Aspergillous infections of the spine had concomittent pulmonary infection in more than 70% of the patients and also had high mortality (60%).,Candida infections were less severe with an average of 19.3% mortality. Rare infections such as histoplasmosis in HIV patients had higher mortality ranging from 50% to 100%. Neurological deficit at presentation was seen in 41.7% of patients with aspergillous infections with 81% requiring surgical intervention. In patients with spinal candidiasis, 22.9% had neurological deficit at presentation with 54.3% requiring surgical intervention. Diagnosis of fungal spondylodiscitis is usually delayed in immunocompromised patients. A high index of suspicion with appropriate investigation is essential for early diagnosis. The histopathological confirmation of the presence of fungal hyphae (true septate in aspergillosis and pseudohyphae being nonseptate in Candida) is essential for diagnosis. In disseminated invasive infections, blood cultures are positive, especially in aspergillosis. Antifungal treatment with the advent of ozoles in 1985, has decreased the morbidity and mortality, which was more with single drug treatment using amphotericin-B. Drug regimen recommended by the Infectious Diseases Society of America. Fluconazole 400 mg (6 mg/kg) daily for 6–12 months or liposomal formulation of amphotericin-B 3–5 mg/kg daily for 2–4 weeks and then fluconazole for 6–12 months were recommended. Voriconazole 6 mg/kg IV 12 h for 1 day followed by 4 mg/kg IV 12 h was recommended; oral dosage is 200 mg every 12 h for a minimum of 6–8 weeks. These are rare infections of the spine but can have significant complications due to delay in diagnosis and frequent neurological deficits at presentation. The most common parasitic infection of the nervous system is cysticercosis. Cysticercosis is caused by implantation of the cestode Taenia solium (pork tapeworm) in humans, serving as an intermediate host. It has a prevalence of 3%–6% in endemic areas and affects approximately 50 million people worldwide, including Central and South America, Eastern Europe, Africa, and Asia. 95%–98% of cysticercosis involves the central nervous system and spinal involvement is reported to be around 1.2%–5.8%. Spinal intradural-extramedullary infection is mostly due to downward migration of larvae from the intracranial compartment to the spinal subarachnoid space. Neurologic manifestations is caused by a combined inflammatory reaction and mechanical compression from intramedullary or extramedullary cysts, leptomeningitis, and ischemia. Treatment involves surgical decompression with albendazole chemotherapy for 6–12 weeks. It usually occurs in humans with exposure to freshwater snails. Approximately 200 million people worldwide are afflicted with schistosomiasis, and approximately 20 million develop severe disease, most commonly central nervous system infections. Since the first description of this disease in the 1930s, approximately 800 cases have been reported, most of them due to Schistosoma manson. Neurologic symptoms are secondary to deposition of eggs with granulomatous reactions in areas of the brain or spinal cord. The medullary form is generally associated with a rapid course and severe weakness. By contrast, in conus-cauda equina syndrome, the symptoms develop more slowly, the distribution of the sensorimotor alterations is predominantly asymmetric, and weakness is less severe. Surgical decompression with laminectomy and biopsy gives the diagnosis. Hydatid disease (echinococcosis) is a parasitosis caused by the larval stage of Echinococcus, the dog tapeworm. Humans act as accidental intermediate hosts and are secondarily infected via the ingestion of food or water contaminated by eggs of the parasite. Lungs and liver infections constitute more than 90% of hydatid disease with 1%–5% involving the bone. Spinal involvement constitutes 50% of bony infections with the thoracic segment of the spine affected in 50% of cases, followed by the lumbar (20%), sacral (20%), and cervical (10%) segments. Marked eosinophilia should be useful in confirming a suspicion of parasitic disease. Casoni test and Elisa test for Echinococcus granulosis IgG are useful for confirmation of the diagnosis. Long-term albendazole with surgical excision of the cyst is recommended. Intraoperative use of scolicidal agents such as 10% betadine or hypertonic saline is recommended to avoid recurrence of hydatid cyst. Incidence of spinal infections is estimated to be around 5% of all osteoarticular infections., Favorable treatment outcome depends on early diagnosis, which is often delayed for an average of 6–12 weeks due to ambiguous symptoms, especially in the immunocompromised host. As in an immunocompetent host, the most common organism encountered in immunocompromised patients is typical bacteria; however, a high index of suspicion must be maintained for atypical organisms. In patients growing multiple organisms on biopsy/culture, all organisms identified should be treated in combination with adequate multidrug therapy. Spondylodiscitis caused by nontuberculous mycobacteria (NTM) is on the rise in immunosuppressed patients and are frequently misdiagnosed as Mycobacterium tuberculosis because of similar clinical and radiographic characteristics and indolent clinical course. It is important to differentiate NTM from M. tuberculosis as antituberculous drugs do not cover NTM sufficiently. In India, most common cause of spinal infections is M. tuberculosis, while in Western world, S. aureus is the most common cause of spondylodiscitis. Fungal infections are very rare cause of spinal infections and are reported mostly as case reports or series. There can be marked delay in diagnosing these infections and average delay in diagnosing them can be as much as 2 months. Common fungal infections reported in the literature are with Aspergillus species, followed by Candida, Coccidioides, Blastomyces, etc. Major problem of spine infections in the immunocompromised host is not about the treatment but establishing an early diagnosis before major neurologic deficits occur, which dramatically increase the morbidity and mortality. As it may take up to 6 weeks for bony erosive changes to manifest on plain radiographs,, contrast-enhanced MRI is the modality of choice for imaging in the patients with suspicion of spinal infections. Incidence of these infections has been rising steadily because of better modalities to diagnose spine infection as well as decline in immune status of the ageing population. Blood cultures should be a routine investigation to be done in high-risk group patients with fever and back pain. The chances of a positive blood culture are about 60% in bacterial spondylodiscitis cases., Every effort should be made to establish a microbial diagnosis. Currently, long-term combination chemotherapy with tailored antibiotics would be considered the standard medical treatment. However, the optimal therapeutic regimen and duration of treatment for infective spondylitis in immunocompromised patient have not been determined. Empirical treatment should be withheld in all but critically ill and high-risk patients with signs of sepsis or those requiring urgent surgical decompression for neurological compromise. Resolution of symptoms and declining values of CRP correlate well with clinical improvement more than radiological changes on MRI. Specific association has not been demonstrated between follow-up MRI and clinical condition of patients. However, follow-up MRI may be required in case of deterioration or lack of clinical improvement. The decision to undertake spinal surgery in an immunocompromised patient for infective spondylitis is complex due to their poor immune response, which adversely affects their nutrition, wound healing potential, and life expectancy. The general medical condition of the patient is also considered, and the benefits of surgery are weighed against the patient's ability to tolerate surgical intervention. Immunocompromised patients with spinal infections are best managed by a multidisciplinary team including an infectious disease expert. High index of suspicion is the key to early diagnosis and isolation of organism causing the infection is essential for appropriate chemotherapy and resolution of infection. MRI is the imaging modality of choice and biopsy as a routine is encouraged. Medical and surgical treatment in this group of patients needs to be individualized as patients with immunocompromise have poor healing ability along with decreased ability to fight infectious agents. Atypical infections including fungal, opportunistic bacterial, or viral infections are more common in this group of patients and need to be considered in the differential diagnosis. Joughin E, McDougall C, Parfitt C, Yong-Hing K, Kirkaldy-Willis WH. Causes and clinical management of vertebral osteomyelitis in Saskatchewan. Spine (Phila Pa 1976) 1991;16:261-4. Krogsgaard MR, Wagn P, Bengtsson J. Epidemiology of acute vertebral osteomyelitis in Denmark: 137 cases in Denmark 1978-1982, compared to cases reported to the national patient register 1991-1993. Acta Orthop Scand 1998;69:513-7. Moutschen MP, Scheen AJ, Lefebvre PJ. Impaired immune responses in diabetes mellitus: Analysis of the factors and mechanisms involved. Relevance to the increased susceptibility of diabetic patients to specific infections. Diabete Metab 1992;18:187-201. Broner FA, Garland DE, Zigler JE. Spinal infections in the immunocompromised host. Orthop Clin North Am 1996;27:37-46. Falakassa J, Hirsch BP, Norton RP, Mendez-Zfass M, Eismont FJ. Case reviews of infections of the spine in patients with a history of solid organ transplantation. Spine (Phila Pa 1976) 2014;39:E1154-8. Weinstein MA, Eismont FJ. Infections of the spine in patients with human immunodeficiency virus. J Bone Joint Surg Am 2005;87:604-9. Colmenero JD, Jiménez-Mejías ME, Sánchez-Lora FJ, Reguera JM, Palomino-Nicás J, Martos F, et al. Pyogenic, tuberculous, and brucellar vertebral osteomyelitis: A descriptive and comparative study of 219 cases. Ann Rheum Dis 1997;56:709-15.
Cooper MD, Lawton AR. Primary immune deficiency diseases. In: Wilson JD, Braunwald E, Isselbacher KJ, Petersdorf RG, Martin JB, Fauci AS, et al., editors. Harrison's Principles of Internal Medicine. 12th ed., Vol. 2. New York: McGraw Hill Inc.; 1991. p. 1395-402. Cunningham ME, Girardi F, Papadopoulos EC, Cammisa FP. Spinal infections in patients with compromised immune systems. Clin Orthop Relat Res 2006;444:73-82. Heary RF, Hunt CD, Krieger AJ, Vaid C. HIV status does not affect microbiologic spectrum or neurologic outcome in spinal infections. Surg Neurol 1994;42:417-23. Bono CM. Spectrum of spine infections in patients with HIV: A case report and review of the literature. Clin Orthop Relat Res 2006;444:83-91. Ragni MV, Crossett LS, Herndon JH. Postoperative infection following orthopaedic surgery in human immunodeficiency virus-infected hemophiliacs with CD4 counts & or=200/mm3. J Arthroplasty 1995;10:716-21. Emparan C, Iturburu IM, Ortiz J, Mendez JJ. Infective complications after abdominal surgery in patients infected with human immunodeficiency virus: Role of CD4+lymphocytes in prognosis. World J Surg 1998;22:778-82. Luck JV Jr., Logan LR, Benson DR, Glasser DB. Human immunodeficiency virus infection: Complications and outcome of orthopaedic surgery. J Am Acad Orthop Surg 1996;4:297-304. Smith MA, Trowers NR, Klein RS. Cervical osteomyelitis caused by Pseudomonas cepacia in an intravenous-drug abuser. J Clin Microbiol 1985;21:445-6. Bryan V, Franks L, Torres H. Pseudomonas aeruginosa cervical diskitis with chondro-osteomyelitis in an intravenous drug abuser. Surg Neurol 1973;1:142-4. Koppel BS, Tuchman AJ, Mangiardi JR, Daras M, Weitzner I. Epidural spinal infection in intravenous drug abusers. Arch Neurol 1988;45:1331-7. Freier DO, Fuchs BA. A mechanism of action for morphine-induced immunosuppression: Corticosterone mediates morphine-induced suppression of natural killer cell activity. J Pharmacol Exp Ther 1994;270:1127-33. Horsburgh CR Jr., Anderson JR, Boyko EJ. Increased incidence of infections in intravenous drug users. Infect Control Hosp Epidemiol 1989;10:211-5. Eibl N, Spatz M, Fischer GF, Mayr WR, Samstag A, Wolf HM, et al. Impaired primary immune response in type-1 diabetes: Results from a controlled vaccination study. Clin Immunol 2002;103:249-59. Blackwell CC, Weir DM, Patrick AW, Collier A, Clarke BF. Secretor state and complement levels (C3 and C4) in insulin dependent diabetes mellitus. Diabetes Res 1988;9:117-9. Rodier M, Andary M, Richard JL, Mirouze J, Clot J. Peripheral blood T-cell subsets studied by monoclonal antibodies in type 1 (insulin-dependent) diabetes: Effect of blood glucose control. Diabetologia 1984 Jul; 27 Suppl: 136-8. Selam JL, Clot J, Andary M, Mirouze J. Circulating lymphocyte subpopulations in juvenile insulin-dependent diabetes. Correction of abnormalities by adequate blood glucose control. Diabetologia 1979;16:35-40.
al-Kassab AS, Raziuddin S. Immune activation and T cell subset abnormalities in circulation of patients with recently diagnosed type I diabetes mellitus. Clin Exp Immunol 1990;81:267-71. Naguib G, Al-Mashat H, Desta T, Graves DT. Diabetes prolongs the inflammatory response to a bacterial stimulus through cytokine dysregulation. J Invest Dermatol 2004;123:87-92. Binymin K, Cooper RG. Late reactivation of spinal tuberculosis by low-dose methotrexate therapy in a patient with rheumatoid arthritis. Rheumatology (Oxford) 2001;40:341-2. Spinozzi F, Cimignoli E, Gerli R, Agea E, Bertotto A, Rondoni F, et al. IgG subclass deficiency and sinopulmonary bacterial infections in patients with alcoholic liver disease. Arch Intern Med 1992;152:99-104. Latvala J, Parkkila S, Niemelä O. Excess alcohol consumption is common in patients with cytopenia: Studies in blood and bone marrow cells. Alcohol Clin Exp Res 2004;28:619-24. Liu YK. Effects of alcohol on granulocytes and lymphocytes. Semin Hematol 1980;17:130-6. Friedman LN, Sullivan GM, Bevilaqua RP, Loscos R. Tuberculosis screening in alcoholics and drug addicts. Am Rev Respir Dis 1987;136:1188-92. Jerrells TR, Sibley D. Effects of ethanol on cellular immunity to facultative intracellular bacteria. Alcohol Clin Exp Res 1995;19:11-6. D'Souza NB, Mandujano JF, Nelson S, Summer WR, Shellito JE. Alcohol ingestion impairs host defenses predisposing otherwise healthy mice to Pneumocystis carinii infection. Alcohol Clin Exp Res 1995;19:1219-25. Stefanovski N, Van Voris LP. Pyogenic vertebral osteomyelitis: Report of a series of 23 patients. Contemp Orthop 1995;31:159-64. Chelsom J, Solberg CO. Vertebral osteomyelitis at a Norwegian university hospital 1987-97: Clinical features, laboratory findings and outcome. Scand J Infect Dis 1998;30:147-51. Beronius M, Bergman B, Andersson R. Vertebral osteomyelitis in Göteborg, Sweden: A retrospective study of patients during 1990-95. Scand J Infect Dis 2001;33:527-32. Mrabet D, Mizouni H, Khiari H, Rekik S, Chéour E, Meddeb N, et al. Brucellar spondylodiscitis affecting non-contiguous spine levels. BMJ Case Rep 2011;2011. pii: bcr0120113788. Carragee EJ. Pyogenic vertebral osteomyelitis. J Bone Joint Surg Am 1997;79:874-80. Belzunegui J, Del Val N, Intxausti JJ, De Dios JR, Queiro R, González C, et al. Vertebral osteomyelitis in Northern Spain. Report of 62 cases. Clin Exp Rheumatol 1999;17:447-52. Nolla JM, Ariza J, Gómez-Vaquero C, Fiter J, Bermejo J, Valverde J, et al. Spontaneous pyogenic vertebral osteomyelitis in nondrug users. Semin Arthritis Rheum 2002;31:271-8. Muffoletto AJ, Ketonen LM, Mader JT, Crow WN, Hadjipavlou AG. Hematogenous pyogenic facet joint infection. Spine (Phila Pa 1976) 2001;26:1570-6. Jarvik JG, Deyo RA. Diagnostic evaluation of low back pain with emphasis on imaging. Ann Intern Med 2002;137:586-97. Dagirmanjian A, Schils J, McHenry M, Modic MT. MR imaging of vertebral osteomyelitis revisited. AJR Am J Roentgenol 1996;167:1539-43. Diehn FE. Imaging of spine infection. Radiol Clin North Am 2012;50:777-98. Dunbar JA, Sandoe JA, Rao AS, Crimmins DW, Baig W, Rankine JJ, et al. The MRI appearances of early vertebral osteomyelitis and discitis. Clin Radiol 2010;65:974-81. Pilleul F, Garcia J. Septic arthritis of the spine facet joint: Early positive diagnosis on magnetic resonance imaging. Review of two cases. Joint Bone Spine 2000;67:234-7. Ohtori S, Suzuki M, Koshi T, Yamashita M, Yamauchi K, Inoue G, et al. 18F-fluorodeoxyglucose-PET for patients with suspected spondylitis showing modic change. Spine (Phila Pa 1976) 2010;35:E1599-603. Lee IS, Lee JS, Kim SJ, Jun S, Suh KT. Fluorine-18-fluorodeoxyglucose positron emission tomography/computed tomography imaging in pyogenic and tuberculous spondylitis: Preliminary study. J Comput Assist Tomogr 2009;33:587-92. Rivas-Garcia A, Sarria-Estrada S, Torrents-Odin C, Casas-Gomila L, Franquet E. Imaging findings of Pott's disease. Eur Spine J 2013;22 Suppl 4:567-78.
de Lucas EM, González Mandly A, Gutiérrez A, Pellón R, Martín-Cuesta L, Izquierdo J, et al. CT-guided fine-needle aspiration in vertebral osteomyelitis: True usefulness of a common practice. Clin Rheumatol 2009;28:315-20. Kim CJ, Song KH, Park WB, Kim ES, Park SW, Kim HB, et al. Microbiologically and clinically diagnosed vertebral osteomyelitis: Impact of prior antibiotic exposure. Antimicrob Agents Chemother 2012;56:2122-4. Zimmerli W. Clinical practice. Vertebral osteomyelitis. N Engl J Med 2010;362:1022-9. Park KH, Cho OH, Lee JH, Park JS, Ryu KN, Park SY, et al. Optimal duration of antibiotic therapy in patients with hematogenous vertebral osteomyelitis at low risk and high risk of recurrence. Clin Infect Dis 2016;62:1262-9. Coskun-Ari FF, Bosgelmez-Tinaz G. GrlA and GyrA mutations and antimicrobial susceptibility in clinical isolates of ciprofloxacin- methicillin-resistant Staphylococcus aureus. Eur J Med Res 2008;13:366-70. Carragee EJ. Instrumentation of the infected and unstable spine: A review of 17 cases from the thoracic and lumbar spine with pyogenic infections. J Spinal Disord 1997;10:317-24. Dai LY, Chen WH, Jiang LS. Anterior instrumentation for the treatment of pyogenic vertebral osteomyelitis of thoracic and lumbar spine. Eur Spine J 2008;17:1027-34. Gorensek M, Kosak R, Travnik L, Vengust R. Posterior instrumentation, anterior column reconstruction with single posterior approach for treatment of pyogenic osteomyelitis of thoracic and lumbar spine. Eur Spine J 2013;22:633-41. Si M, Yang ZP, Li ZF, Yang Q, Li JM. Anterior versus posterior fixation for the treatment of lumbar pyogenic vertebral osteomyelitis. Orthopedics 2013;36:831-6. Doita M, Nabeshima Y, Nishida K, Fujioka H, Kurosaka M. Septic arthritis of lumbar facet joints without predisposing infection. J Spinal Disord Tech 2007;20:290-5. Frazier DD, Campbell DR, Garvey TA, Wiesel S, Bohlman HH, Eismont FJ, et al. Fungal infections of the spine. Report of eleven patients with long-term follow-up. J Bone Joint Surg Am 2001;83-A: 560-5. Ganesh D, Gottlieb J, Chan S, Martinez O, Eismont F. Fungal infections of the spine. Spine (Phila Pa 1976) 2015;40:E719-28. Foley JP, Legendre AM. Treatment of coccidioidomycosis osteomyelitis with itraconazole in a horse. A brief report. J Vet Intern Med 1992;6:333-4. Wheat LJ, Freifeld AG, Kleiman MB, Baddley JW, McKinsey DS, Loyd JE, et al. Clinical practice guidelines for the management of patients with histoplasmosis: 2007 update by the Infectious Diseases Society of America. Clin Infect Dis 2007;45:807-25. Chapman SW, Dismukes WE, Proia LA, Bradsher RW, Pappas PG, Threlkeld MG, et al. Clinical practice guidelines for the management of blastomycosis: 2008 update by the Infectious Diseases Society of America. Clin Infect Dis 2008;46:1801-12. Andaluz N, Zuccarello M. Multidrug-resistant, progressive, invasive diffuse spinal aspergillosis: Case report and review of the literature. J Neurosurg Sci 2008;52:49-53. Gathe JC Jr., Harris RL, Garland B, Bradshaw MW, Williams TW Jr. Candida osteomyelitis. Report of five cases and review of the literature. Am J Med 1987;82:927-37. Klepser ME, Wolfe EJ, Jones RN, Nightingale CH, Pfaller MA. Antifungal pharmacodynamic characteristics of fluconazole and amphotericin B tested against Candida albicans. Antimicrob Agents Chemother 1997;41:1392-5. Brajtburg J, Powderly WG, Kobayashi GS, Medoff G. Amphotericin B: Current understanding of mechanisms of action. Antimicrob Agents Chemother 1990;34:183-8. Pappas PG, Kauffman CA, Andes D, Benjamin DK Jr., Calandra TF, Edwards JE Jr., et al. Clinical practice guidelines for the management of candidiasis: 2009 update by the Infectious Diseases Society of America. Clin Infect Dis 2009;48:503-35. Walsh TJ, Anaissie EJ, Denning DW, Herbrecht R, Kontoyiannis DP, Marr KA, et al. Treatment of aspergillosis: Clinical practice guidelines of the infectious diseases society of America. Clin Infect Dis 2008;46:327-60. Garcia HH, Del Brutto OH. Taenia solium cysticercosis. Infect Dis Clin North Am 2000;14:97-119, ix. García HH, Gonzalez AE, Evans CA, Gilman RH; Cysticercosis Working Group in Peru. Taenia solium cysticercosis. Lancet 2003;362:547-56.
do Amaral LL, Nunes RH, da Rocha AJ. Parasitic and rare spinal infections. Neuroimaging Clin N Am 2015;25:259-79.
do Amaral LL, Ferreira RM, da Rocha AJ, Ferreira NP. Neurocysticercosis: Evaluation with advanced magnetic resonance techniques and atypical forms. Top Magn Reson Imaging 2005;16:127-44. Ross AG, Bartley PB, Sleigh AC, Olds GR, Li Y, Williams GM, et al. Schistosomiasis. N Engl J Med 2002;346:1212-20. Ferrari TC, Moreira PR. Neuroschistosomiasis: Clinical symptoms and pathogenesis. Lancet Neurol 2011;10:853-64. Artal FJ, Mesquita HM, Gepp Rde A, Antunes JS, Kalil RK. Neurological picture. Brain involvement in a Schistosoma mansoni myelopathy patient. J Neurol Neurosurg Psychiatry 2006;77:512. Neumayr A, Tamarozzi F, Goblirsch S, Blum J, Brunetti E. Spinal cystic echinococcosis – A systematic analysis and review of the literature: Part 1. Epidemiology and anatomy. PLoS Negl Trop Dis 2013;7:e2450. Ray R, De PK, Karak K. Combined role of casoni test and indirect haemagglutination test in the diagnosis of hydatid disease. Indian J Med Microbiol 2002;20:79-82. Besim H, Karayalçin K, Hamamci O, Güngör C, Korkmaz A. Scolicidal agents in hydatid cyst surgery. HPB Surg 1998;10:347-51. Giri U, Thavalathil BC, Varghese R. Vertebral osteomyelitis in an immunosuppressed patient with rheumatoid arthritis. BMJ Case Rep 2014;2014. pii: bcr2014206944. Im JH, Baek JH, Kwon HY, Lee JS. Paradoxical reaction of tuberculous vertebral osteomyelitis: A case series. Infect Dis (Lond) 2015;47:271-4. Kim CJ, Song KH, Jeon JH, Park WB, Park SW, Kim HB, et al. A comparative study of pyogenic and tuberculous spondylodiscitis. Spine (Phila Pa 1976) 2010;35:E1096-100. Kowalski TJ, Layton KF, Berbari EF, Steckelberg JM, Huddleston PM, Wald JT, et al. Follow-up MR imaging in patients with pyogenic spine infections: Lack of correlation with clinical features. AJNR Am J Neuroradiol 2007;28:693-9.